Synthesis, Technology and Applications of Carbon Nanomaterials explores the chemical properties of different classes of carbon nanomaterials and their major applications. As carbon nanomaterials are used for a variety of applications due to their versatile properties and characteristics, this book discusses recent advances in synthesis methods, characterization, and applications of 0D -3D dimensional carbon nanomaterials. 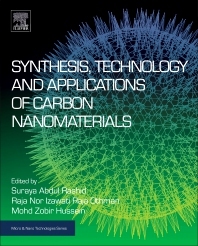 It is an essential resource for readers focusing on carbon nanomaterials research. Currently holds the position of Head for the Materials and Processing Laboratory, Institute of Advanced Technology (ITMA) and Associate Professor at the Department of Chemical and Environmental Engineering, Faculty of Engineering, Universiti Putra Malaysia (UPM), Malaysia. Her research interests revolve around synthesis, processing and characterization of various nanomaterials namely carbon nanostructures. Her research has also extended into use of nanomaterials for a variety of applications such as high performance nanocomposites (polymers and concrete), supercapacitors, nanosensors and more recently nanoagriculture. Senior Lecturer at the Department of Mechanical Engineering, Faculty of Engineering, Universiti Pertahanan Nasional Malaysia (UPNM), Malaysia. Her field of specialization is synthesis and application of carbon nanostructured materials and functional polymer nanocomposites. Currently, she holds a position as Research Fellow for Nanomaterials at the Centre for Defence Research and Technology, UPNM. Currently holds the position as Professor and Research Fellow for Nanomaterials at the Materials Synthesis and Characterization Laboratory, Institute of Advanced Technology (ITMA), Universiti Putra Malaysia (UPM), Malaysia. He and his research group focus their research works on nanomedicine, especially for theranostics delivery systems, nanomaterials for thermal energy storage and agronanochemicals. His group also works on nanomaterials for green, comfortable building applications by core-shell nano-encapsulation approach for thermal energy storage using phase change materials as the core and polymer or activated carbon pores as the shape stabilizing agents.